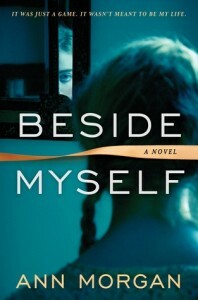 Beside Myself is a literary thriller about identical twins, Ellie and Helen, who swap places aged six. At first it is just a game, but then Ellie refuses to swap back. Forced into her new identity, Helen develops a host of behavioural problems, delinquency and chronic instability. With their lives diverging sharply, one twin headed for stardom and the other locked in a spiral of addiction and mental illness, how will the deception ever be uncovered? Exploring questions of identity, selfhood, and how other people’s expectations affect human behaviour, this novel is as gripping as it is psychologically complex. Beside Myself is my first DNF in… probably forever. Usually I struggle through a book, no matter what, and I keep on going. But here, I just couldn’t. Several things worked against this book, and I’ll list them all below. I did read the ending just to see where it would lead (I had half-expected that end) but I quit after fifty pages. Let’s start with the good. The plot is unique, and original. Two twin sisters, one the leader, the other the follower, and they switch positions. Helen becomes Ellie and Ellie becomes Helen. Except when the joke is over, Ellie doesn’t want to switch back, and Helen is stuck taking on the role of Ellie, who everyone laughs at, who is slow, who Mom is always angry at. With Mom’s new boyfriend coming into play, things don’t get easier for Helen either, and no one seems to have a clue that they switched places. Even when she tells them, no one believes her. The book alternates between present and past. In the past, we see Helen and Ellie as they grow up. In the present, Smudge, as Helen has started calling herself, lives the life of an addict. Everything she knows has fallen apart. Meanwhile, Ellie – posing as Helen – has become quite famous. A lot of people loved this book, and I understand why. The plot is unique, and the author’s writing is descriptive and lyrical. It’s just not for me. On to the bad. First of all, the writing style. I’ve seen descriptions that run several paragraphs long in this book and before I figured out what the author was trying to say, I was almost a page further. It’s page after page filled with these descriptions that are beautiful writing but significantly slow down the narrative. I had to skim pages just to find the plot, it was hidden under so many descriptions. Next up, the story. It annoyed me to no end. I had to stop reading primarily because of this – my heart beat was going way too high, and I was ready to pull my hair out. I was so annoyed at EVERYONE in this book. At the mother figure in particular. How can you not tell your own children apart? And then, with that ending, I hated her even more. I was annoyed with the way everyone treated Ellie and later Helen. If a child, part of a twin set you can’t keep apart, keeps saying she’s not the twin you think they are, then someone, at least one adult, will grow concerned. It would be so easy to fix this! Blood testing. DNA. Handprints. Or if Ellie is really so slow as the book wants us to believe, have them both do a test and see how the scores work – in that scenario, Helen would’ve done a lot better than Ellie. Poor Helen. I felt so sorry for her. She was so helpeless, and this annoyed me so much. I was going to freak out if I kept on reading, because the scenario made no sense. Not even Helen’s friends recognize her? Some friends they are. It’s very hard to believe no one will figure it out. Also, a thriller? I don’t really see any thriller aspects in the book. It’s mostly about mental health, and Helen’s struggle. Ultimately, a lot of people liked this book (just check the Goodreads reviews, lost of 4 and 5 stars) but I couldn’t finish it. It annoyed me too much, and I don’t want to waste my time reading a book that annoys me to no end. It sounds like I wouldn’t like it either. I mean come on, someone can’t tell them apart? Parents or somebody? Sounds like a fun premise but again, I think someone would figure it out. Even school testing might give a clue. Nice of the other sister to pull a stunt like that, too. Yeah, it annoyed me so much that NO ONE discovered it. I’ve got this book on hold at the library. The premise is so intriguing, but I can see how it could be annoying too. You have to wonder how a mother wouldn’t know her own children. I think they were like 6 when this happened, so friends probably weren’t the best to tell them apart. Glad to see I am not the only one that struggled with this book. Sorry to hear you didn’t finish this one. I usually try to push through a book too, but sometimes you just have to walk away from it. The writing style and plot sound like they would definitely bother me too. sounds like it would be torturous to read about years and years of her struggle and doesn’t sound like there is a positive payoff. why bother? I would like to know the ending though, but think reading this would be a depressing waste of my time.